Gifts from the Pirates: "Just play. Have fun. Enjoy the game." Today Mrs M had a lot of work to do at home and with Opeie in the house it's virtually impossible for her to get anything done. So I decided to take him out for a while to give her a bit of space to work. 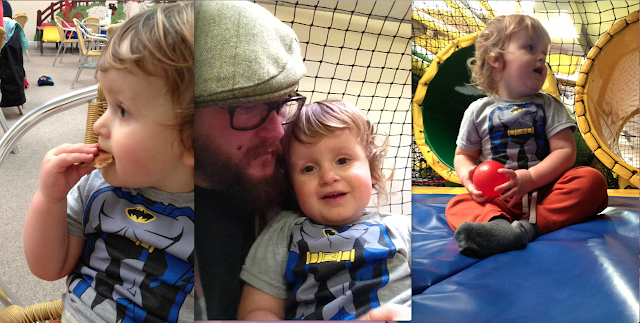 The weather was awful, freezing cold and pouring with rain so I decided to take him to an indoor padded play area down the road. It's the first time Opeie has been to one mainly because I don't really like them. They always seem dirty. They all have the same musty smell and you can pretty much guarantee that there will be some boisterous older children running about not watching what they are doing. Mrs M rang ahead and it was the under two's session so I thought we should give it a try but not before Mrs M loaded us up with antibacterial hand wash. We're not freaks were just very wary about what the boys are putting their hands on. We got to the place and I was pleasantly surprised. The staff were lovely it seemed pretty clean and the £3 entrance fee even included a cup of tea, drink for opeie and a plate of biscuits. Doesn't get better than that. Opeie's little face lit up when he saw the ball pit (he loves balls). 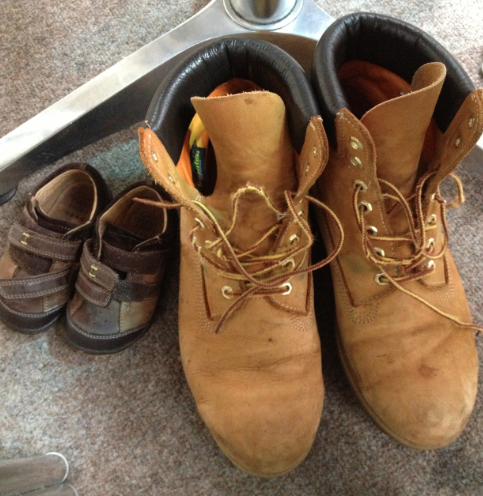 We took our shoes off and headed for all the fun. 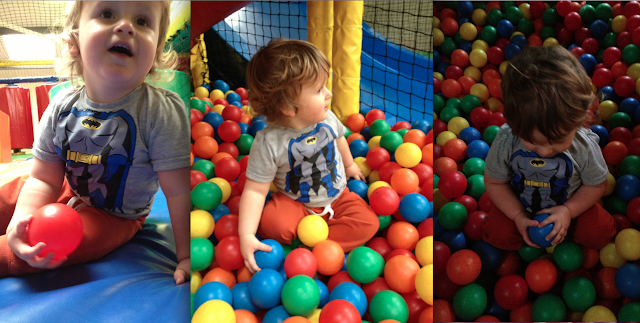 We got straight into the ball pit and Opeie was a very excited little boy. It was really difficult getting a clear photo as he wouldn't stay still and who could blame him. Seeing how excited he was I felt kind of guilty that we hadn't taken him before. Not only for the running about and rolling around in a ball pit but also for the interaction with other children. All the children there were around the same age group and Opeie clearly loved being around them squeaking with excitement. I'm not sure if its Seth's muscle condiction but he wasn't very adventurous when he was younger, he would never climb in the play areas and was pretty scared at the thought of going up to the higher levels. Opeie is the exact opposite and is pretty fearless. He's always been a climber, it took him a long time to start walking but had no problems going upwards from a very young age and being there today this side really came out of him. I was genuinely shocked when he climbed up a padded ladder with very little help from me. At his age I didn't expect him to be so strong (I think he's going to be a tough cookie like daddy). Well we had a great couple of hours, Opeie was so tired when we came out that i strapped him into his car seat and he fell asleep before i had even closed the car door... Adorable. When we got home we curled up on the sofa and he had a nice long nap so Mrs M got some extra quiet time to continue what she was doing. Sounds like a brilliant day for Opeie, must have really enjoyed himself.